In 1997 I was living in Paris and my boyfriend at the time came to visit. 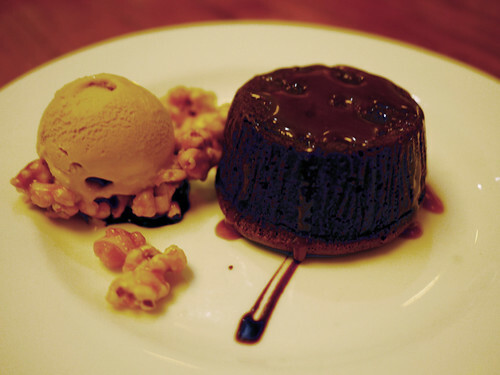 We were having dinner one night, near Les Halles of all places, and I ordered a molten chocolate fondant. Ever since then warm chocolate cakes have held a particularly special place in my heart, though I don't order them often for fear of degrading that memory. Fortunately, this one, with salted caramel ice cream and caramel popcorn was spot on. I love a good warm chocolate cake! The melty chocolatey taste sensation is amazing!